I thought it might be fun to share some thoughts on my home town, Sydney. I am traveling home later in the summer to walk on the beaches of my childhood, to fill myself with the sights and sounds of home. One of the best things about Sydney is the gardens with views of the water. The Botanical Gardens can be entered from the St James station end, across from the New South Wales Art Gallery, or from down near the Opera House. It is a lovely planned garden, with a plethora of interesting and brightly colored flowers, wandering Ibis, shelters and follies. You can see fabulous views of the water from the gardens. Other fantastic views are just around the curve of the walk. Locals wander the gardens too; it’s a favorite place for lunch in the middle of the city. No trip to Sydney would be complete without a visit to a beach or two. One of my most favorite memories is taking a ferry ride over to Manly (a passenger ferry, boarded via a plank, I kid you not). Along the boardwalk, on the way to the beach, get some fish and chips to eat out of the paper bag, hot and fresh, on Manly Beach. Another treat is to take a train out to some of the Southern Beaches. If rivers are more to your liking, the National Parks are accessible by train from Central Station, and you can rent a row boat for an easy afternoon on the water. It’s true that we have the wackiest animals on the planet. Among them are kangaroos and koalas. Locals who rescue roos will tell you that the little blighters do kick, as I learned when I was in high school. A friend rescued a wallaby, and when it had grown a bit, we got kicked if we got in its way. The cuddly looking koalas sport wicked claws, all the better to climb the local gum trees. Find both of these animals at Taronga Park Zoo. Catch a view of the emu, the crocodile and the lyrebird with its fabulous plumage too. You can also get up close, though behind glass, from some of the worlds most poisonous critters, if that takes your fancy. Hyde Park is a great lunch spot in the middle of the city. 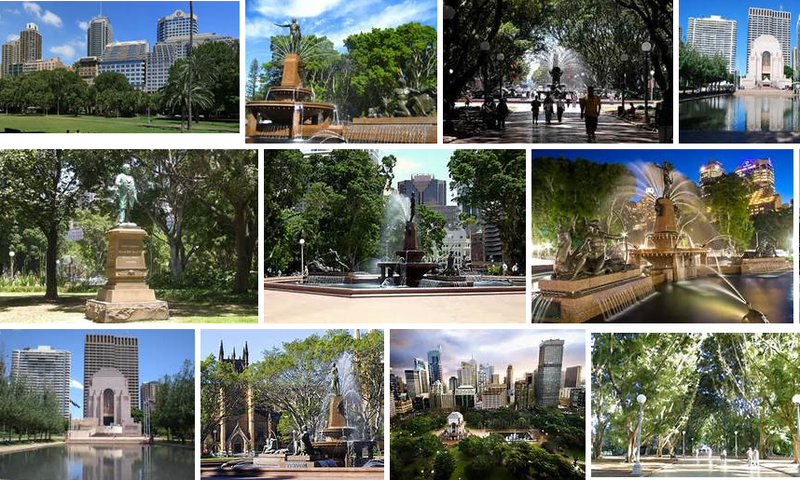 Visit the Archibald Fountain, with its classic Greek figures Apollo, Diana, Pan and the Minotaur, right across from St Mary’s Cathedral near St James railway station. St Mary’s is a lovely spot, and interesting for being a north facing cathedral, instead of the usual east-facing architecture. Bit of a novelty. It even has a lady chapel all the way to the north, behind the main altar. Not something you’ll find on the tourist information sites. The War Memorial in Hyde Park has a figure of the fallen soldier, draped across his shield, and mothers carrying the fallen. The contemplation pool outside the memorial reflects all the moods of the Sydney sky. A walk across the street finds you at the Sydney Museum where you will find dinosaur bones and more rocks than you can poke a stick at. Along the way, stop to enjoy the enormous Morton Bay fig trees that are a feature of the park. Sit under a tree and watch the birds and do some people watching. When you’ve had your fill, find a café for some tea and scones, or latte served in a glass cup. If you get lost, chat with a shopkeeper, or some of the locals. They’re friendly, I promise. Colleen tells me that shortcrust pastry gets its texture from shortening the gluten strands with a fat. This makes it melt-in-the-mouth. In Seattle, the humidity in the air requires attention to the texture of the mix and you may need to add or subtract flour to get the desired end. A light hand is needed to avoid overworking the pastry. Sweet pastry should be able to stand on its own, and for Colleen’s preferred recipe, it can be sliced up and served as shortbread. Cream butter and sugar together using your hand. Add one egg and mix thoroughly. Wrap in plastic or wax paper and put in fridge for half an hour. Take out of refrigerator and place between two sheets of plastic or wax paper. Use rolling pin to roll out to the desired size and thickness. Remove one side of the paper or plastic and roll loosely around the rolling pin to lift it. Roll out over pie dish, pastry side down. Ease pastry into the corners without stretching. Finish the edges by pinching between finger and thumb to flute edges. Use parchment paper as a barrier for the weights. Add pastry weights to fill base evenly. This will prepare the pastry and cook it partially so it does not become soggy when you add a wet filling. Remove the weights and parchment paper (dough will still be moist on bottom). Cook for another 5 minutes to dry the bottom of the pastry. The pastry is now ready for filling. These are modern fables, tales of the ordinary acts of kindness and friendship, of discovery and adventure. Purely invented, they come from memories of childhood. They occur at the intersection of seeing the animals in the wild, and imagining what their lives would be like if they could tell us stories. Billabong Flats is a mythical place in the Australian Bush. It is somewhere on the Eastern part of the continent, in the hills, between Sydney and Melbourne, thereabouts. It is also in another fictional world at the same time. Billabong Flats shares virtual space within my love affair with other imaginary places like the Five Acre Wood, the Peace Rock, and the abode of Ratty and Mole. It is just as real as you’d like it to be – no more, and no less. In my stories, the animals dream the world, as much as the world creates them. The Land speaks through them. They welcome all, no matter how different they may be, or what native languages they may speak. When they come together, they can all speak the same tongue. The voices become that of friendship and accord, where all can have adventures together. “Each according to their nature,” says Flying Fox, who likes to have fun. “Each according to their means,” says Koala, who is wise in such things. The first adventure occurs when Koala organizes the First Billabong Flats All Creature Race. The letters are all in capitals, because it’s a Very Important Thing. There is a sense of fair play at Billabong Flats. Friendship is as important as winning, though winning the race would be a fine thing, if only there are not too many distractions. It’s an opportunity to get together and have fun. Koala is the organizer. She is a busy and industrious being, when she is not sleeping, which is most of the time. I wrote this first story during the American election in 2016. My sweetie was annoyed at the shenanigans of the election, and the story was written for his internal eight year old, the child inside him. He loved fairness and justice; this one is for you my Raven. When the world gets too noisy, and there is discord and strife all around, come visit the world of Billabong Flats and have some fun. We’ve all been there. The stage is set, the outline written, and the writing is flowing right along, all on schedule. The deadline comes and passes, and 2000 or so words a day are humming right along. Then the deadline, artificial or not, passes. Falling down from the state of focus, distraction settles in. The momentum of NaNoWriMo passes and that 50,000 words fails to become 75,000 and a finished novel. What now? There are various strategies of course. Write blog posts like this instead – at least you are writing something, right? I don’t know why the last set of drafting the novel seems more difficult than the first three quarters, but for me, that’s the way of it. I don’t even have the excuse of it being the first story. To be honest, the first one was hard in the home stretch too. Some of the distractions come from the second novel in the series sparking ideas about how to make the first one better. Other distractions come from the business of writing and the need to update web sites, however, some of it is just procrastination to be sure. Bad me, right? I wonder what other folks do to motivate themselves over the finishing line? Share ideas in the comments. Looking for inspiration my friends. I’ve been making a mushroom sauce for years now, and it’s a versatile base for a range of different meals. By moving towards olive oil, and adding tofu and coconut milk, I can make it vegan; by taking out the garlic I can move it from savory to sweet; and for a spicy change, I add chile and chocolate. Here is the basic recipe, with some variations I’ve invented over time at the end. The most ambitious variation is one that results in a “chocolate marsala creme sauce”. Odd as it may seem, the chocolate marsala version is great with steak. Add wine. Saute garlic in oil (or butter). IMHO olive oil tastes better. Add mushrooms and cook until soft, stirring continually. Squeeze 2 lemons and stir well. Chocolate Marsala sauce – this has the most variations, so it likely qualifies as a separate recipe. Basically, leave out the garlic, add tamarind to taste, 3 pinches chipotle chile and a cup of semi-sweet chocolate, and blend after cooking, but before serving. This variation uses creme fraiche, and does not require thickening. It is a great accompaniment for steak, lamb, salmon or chicken. The character of the sauce is tart/sweet and smooth. It has a complex mouth-feel, and can be adjusted towards chocolate/spice or savory/tart.